Behringer's take on the classic Auratones won't break the bank — but will they help you make those crucial mix-balancing decisions? Although long discontinued, the Auratone 5C Super Sound Cube still has a well-deserved reputation as an exceptional mix-balancing tool. For the latest generation of mix engineers, Avantone Pro's current homage to that single-driver, closed-box design, the MixCube, provides an excellent modern substitute. I explain many of the merits of such speakers in my review of the Active MixCube in SOS June 2010: /sos/jun10/articles/mixcubeactives.htm. 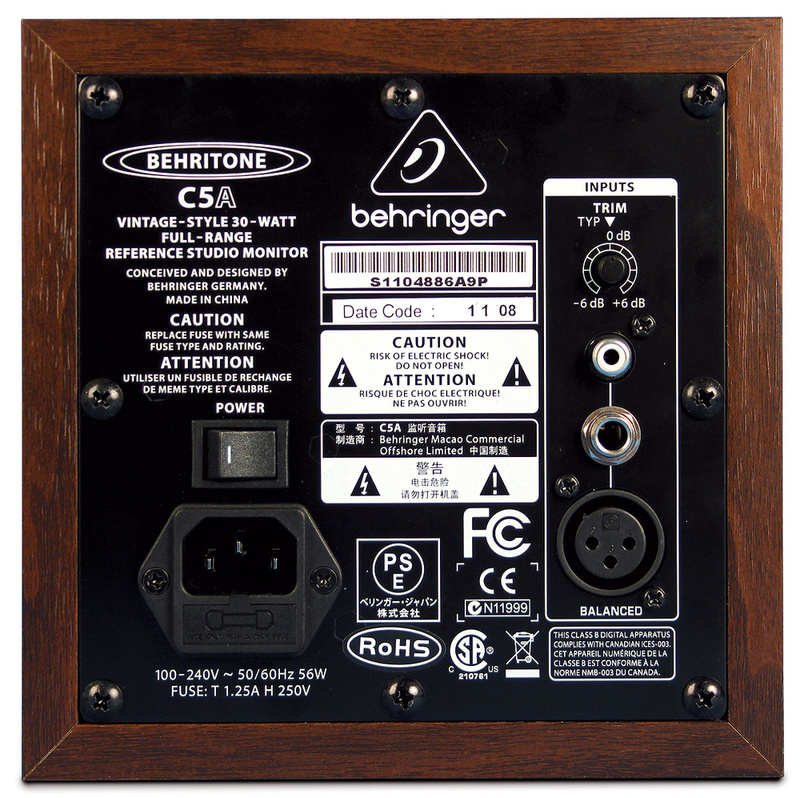 Now, however, Behringer have also decided to target this market niche with their two new Behritone speakers, the C5A and the C50A, promising similar functionality at a fraction of the cost. 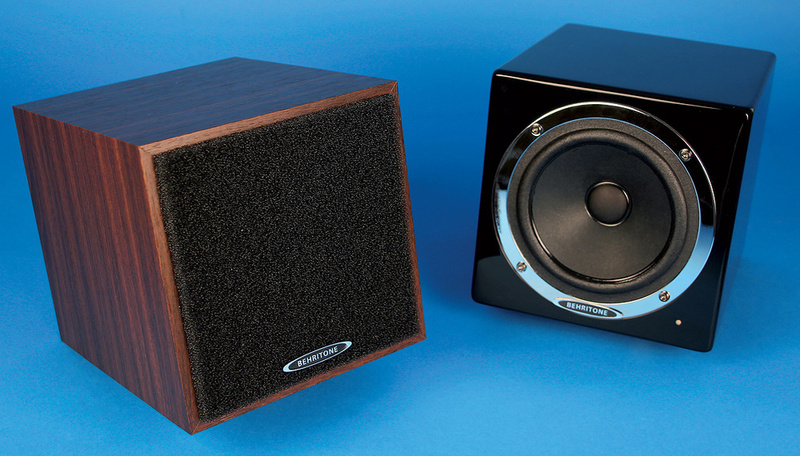 Cosmetically, the wood-finished C5A and glossy black C50A offer the sincerest form of flattery to the Auratone 5C and MixCube Active, respectively, and appear to be voiced accordingly, with the C5A being more restricted in the frequency domain. Both cabinets are 5cm longer than their cube-shaped muses, the extra depth accommodating a separate sealed amplifier/PSU compartment at the rear. Each speaker has its own Class-D amp, rated at 30W (RMS). 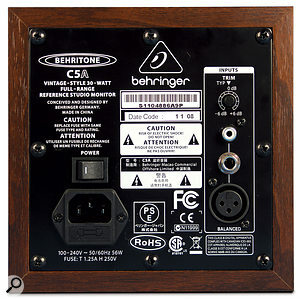 The two back panels are essentially identical, featuring XLR, TRS and RCA phono inputs for balanced/unbalanced input signals, as well as a small ±6dB trim control. Both units are magnetically shielded and follow Avantone's lead in providing rubber non-slip matting on the underside of the speaker, with a 5/8-inch threaded socket (and 3/8-inch adaptor) for stand-mounting purposes. A front-panel LED lights blue during normal use, and reddens to indicate input clipping. Interestingly, the C5A lit its clip LED at an input level about 5dB lower than the C50A, and (less surprisingly given their amplifier Wattages) both Behritones were distorting audibly well before my Avantone was showing any signs of strain. That said, in general, these kinds of speakers aren't designed to sound particularly pleasant cranked up, and both Behritones give out more volume than I can ever imagine myself using in a nearfield situation. However, if you insist on crimping your cochlea, the C50A, in particular, will cheerfully supply a suitably hazardous volume at close range. The C5A and C50A both have XLR, jack and phono sockets, and a ±6dB trim control. So much for the boring stuff: clearly what matters about any speaker is how it sounds and, specifically in this case, how its usefulness at mixdown compares with other single-driver speakers you might have in your sights. I compared both speakers directly with my own Avantone MixCube Active, as well as with the Canford Audio Diecast speaker, a more lo-fi, single-driver, closed-box speaker primarily intended for talkback purposes, but which I've frequently used as an Auratone substitute. At the low end, the C5A rolls off extremely rapidly below about 150Hz, in a way that definitely raised my eyebrow, given the much gentler LF dive typical of most closed-box designs. In practice, this means that a great deal of information simply drops off the radar when you're trying to balance low-end instruments with this speaker, and that the low frequencies that do get through have a tendency to mislead because of the kinked spectral contour: crucial kick/bass and kick/snare ratios in rock recordings become tough to nail down with any confidence, for example. This is actually one of the Auratone 5C's strong suits, believe it or not, because although its low-end lacks power, it nonetheless exhibits a fairly smooth and progressive roll-off which makes the relative proportions of different frequency bands in the lower half of the spectrum easier to gauge. The Avantone MixCube, too, excels in this area, and even the Canford speaker puts in a much more creditable performance than the C5A. The C50A boasts a more extended and well-behaved bass response than its sibling, so fares a lot better from this standpoint. However, kick/bass balance decisions are still complicated by a certain sluggishness in both Behritones' transient response. Drum hits feel slightly smoothed and smeared somehow, such that short, punchy drums seem to lose attack and gain length in a way that adds a shadow of doubt when you're trying to place them relative to other sounds in the mix. For similar reasons, the levels of hand percussion, hi-hat, clean rhythm guitar, and piano also seem more straightforward to balance when using my MixCube than when using either of the Behritones, while the C5A again seems outgunned here by both the C50A and the Canford Diecast. The C50A with its back panel removed, showing the 30W Class-D amplifier. At the high end, there's quite a lot of variance. One of the main weaknesses of the Canford speaker for me has always been that its upper octaves are hyped, such that it's easy to undercook hi-hats, percussion and cymbals, and difficult to assess vocal sibilance levels. Its validity as a mid-range reference is also compromised, because a lot of consumer listening scenarios involve off-axis or indirect auditioning, which tends to punish the HF disproportionately. I have some similar concerns with the C50A, although its high-end emphasis seems to focus unduly on the top octave, while underplaying the vital 2-5kHz region. The result is that any sound with lots of crispy 12-16kHz energy receives unwarranted prominence in the balance, so you're less likely to work hard carving out the proper space for things like airy pop vocals or noise-encrusted sampled hooks. In stark contrast is the C5A's rather muffled HF timbre, which, in conjunction with its starved LF, directs the listener's ears forcibly towards the mid-range. As such, this speaker could be said to score points over its stablemate as a restricted-bandwidth 'grotbox' reference. Needless to say, it's far from a pleasant listen as a result, although, to be fair, that's inevitable to an extent if such a speaker is to do its job properly, and I found the C5A's tone no uglier subjectively than that of the Canford, which I've often angled slightly away from me to tame its fatiguing brashness! Overall, though, the Avantone's high end definitely charts the most sensible course for me, clearly focusing the ear on the mid-range, while allowing the frequency extremes to tail off comparatively benignly, so that you can still reliably balance instruments with strong HF components. Although the Auratone 5C is mistakenly regarded by some users simply as a lo-fi reference (in other words, an approximation of poor-quality consumer systems), its distortion performance isn't at all bad, which means that although you get a mid-heavy frequency response, that mid-range remains pretty clear-sounding. To my ears, the Avantone MixCube represented a significant improvement on this aspect of the original design, and it communicates low-level mix details and front-to-back depth much better than the Canford. This is where the Behringers come most unstuck, for me. The front-to-back dimension seems to all but disappear on these monitors, and it's a struggle to hear finer points of the mid-range balance. Gaps in the mix that can be clearly examined using the Avantone are veiled by the Behringers, so you get little sense of how well (or not) your reverbs and delays are working, for instance, and it can be a struggle to disentangle your cymbals from your electric guitars. What struck me most about this lack of clarity is that it seems to make mixes sound better blended and 'glued' than they really are, whereas both the Auratone 5C and the Avantone MixCube tend to do the opposite, and I think this kind of flattery is a hindrance at mixdown. In addition, I noticed that the audio 'fog' seemed to descend most heavily when listening at lower volumes (as I prefer to), so if you want to make the best of the available resolution, you may want to drive the Behritones quite hard, at the risk of earlier listening fatigue. While it's probably clear by now that I don't think either of the Behritones can seriously compete with the Auratone 5C or Avantone MixCube as a surgical balance tool at mixdown, that shouldn't really come as a surprise, given that a Behritone officially retails at two thirds the price of a Canford Diecast and half the price of a MixCube Active — a differential further exaggerated by dealer markdowns at the time of writing. When it comes to studio monitoring, my experience is that you tend to get what you pay for, and nothing these speakers have shown me revises that opinion. As such, the primary question you need to consider as a prospective purchaser is whether the insights these speakers do actually offer are worth the outlay in their own right, which is a completely different matter. If you listen to your mix through any smallish single-driver speaker, you'll likely get a clearer view of your mix's mid-range than through budget two-way speakers, and if you use just one box in mono you'll also almost certainly find it easier to judge the balance of centrally panned sounds than you would working in stereo. In this respect, and once you've acclimatised to its personality, a single C50A gives little ground to the Canford speaker, and it provides the cash-strapped recording musician with reasonable bang-for-buck. As for the C5A, its spectral bracketing feels rather too severe for any serious mixing work, and it hardly justifies its price merely as a lo-fi 'grotbox', given that crummy multimedia speakers are 10 a penny in PC World. However, what might still swing your vote is that it's nonetheless fairly handy for carrying out detailed lead-vocal automation towards the end of the mixdown process — as, indeed, is the C50A. It may not be easy to find the best level for the singer relative to other elements in your mix, but once you've made that balance decision, you should be able to hear enough to maintain the chosen vocal position pretty solidly with fader rides. Handy for judging detailed lead-vocal fader rides during the later stages of mixdown. The C50A provides some useful supplementary information about the mid-range balance, especially for those using headphones or budget stereo nearfields for their main monitoring. The C5A's severely curtailed frequency bandwidth undermines its usefulness at mixdown. Transient sounds feel rounded and lengthened, and are therefore not as straightforward to balance as on an Auratone 5C or Avantone MixCube. 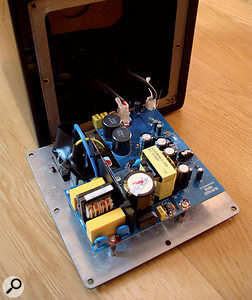 Poor distortion performance obscures important low-level mix details and collapses the front/back listening dimension. While neither of these speakers is in any danger of supplanting the Auratone 5C or Avantone Pro MixCube in my affections when it comes to critical mid-range analysis, I imagine that impecunious home recordists relying on headphones or budget nearfields may find that the C50A offers enough additional mixing power to justify its very modest cost. C5A €258; C50A €310. Prices are per pair. The Music Group +49 2154 9206 4149. C5A $200, C50A $220. Prices are per pair. The Music Group +1 425 672 0816.